It was my first time to dine at Texas Joes House of Ribs. It was a dinner treat by my lovely niece. My brother is looking for a good place to dine and we suddenly remembered Texas Joe's due to the positive reviews about the place. We know that Texas Joe's served mostly American foods, baby back ribs being it's specialty. Price of the foods here is a bit expensive but they serve a large portion of meal, thus the foods is worth the price. I also love the presentation of the foods especially their salads. We did not have the chance to take a photo of the foods served to us as we were busy chatting and laughing. At any rate, we've enjoyed our meals that night. The ambiance of the restaurant is so nice. It's cozy and very presentable. I like the service, too. The service staff are very accommodating and they look so well with their Cowboy uniforms. It was a bit crowded the night we went there. This place is such a hot to both local and foreign tourists. I swear to be back here with hubby and kids for another great dining experience. 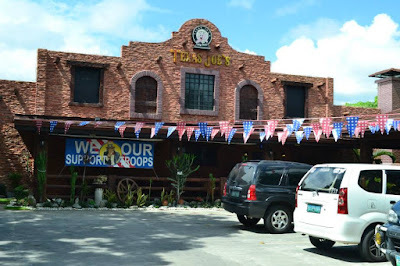 Texas Joe's House of Ribs is located at waterfront Road corner Mc Kinley St. Subic Bay Freeport Zone. You may contact them at (047) 252 3189. They are open from 11Am to 10PM on weekdays and 11AM to 11PM during weekends.